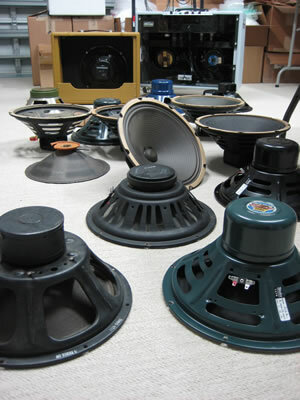 The Speed Shop is Proud to Provide the A12Q AlNiCo Speaker - Modeled After the Best Vintage Period Jensens! In my opinion, the perfect speaker match for a Tweed Deluxe is a vintage Jensen P12Q Alnico speaker. 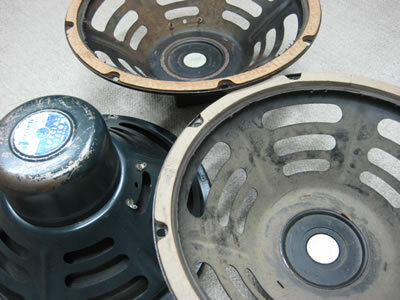 However, these speakers are very troublesome for they are somewhat rare and often found in various stages of disrepair. 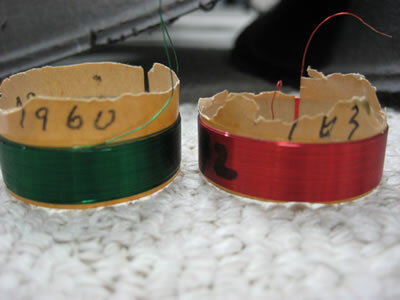 Cone cry, voice coil rubs, rattles, warped spiders and bent frames are all too common; as are also torn, dry rotted or otherwise very weak cones that can distort the voice coil and cause audible artifacts at various frequencies. Moreover, many old Jensens exhibit a high midrange bump in response that can be hard to deal with under certain operating conditions. That said, there is nothing like a *good* vintage P12Q. From compressed cleans to heavy overdrive, these speakers cover all the bases with a frequency response that is complex, round, tight in the low end with a mid-centric boost, and clear, sweet highs - a great match for the 5E3 circuit. The simplest way I can explain it is that, with a good P12Q you just don't want to stop playing because what you're getting back from the amp is so intoxicating that it continually leads you on and on into new musical discoveries and tonal landscapes, no matter the guitar or gain setting. 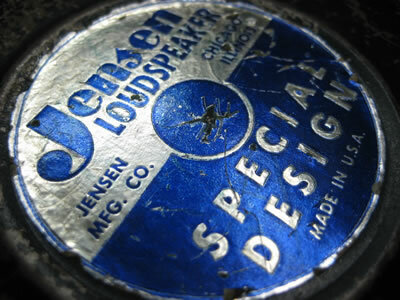 Again, due to the difficulties with vintage Jensens mentioned above, the Speed Shop has always been on the lookout for the perfect new production speaker that can rival the best of the original P12Qs. After searching for months and months, auditioning speaker after speaker, the best candidates have been from Weber Speakers; which has led to a further joint development between Weber and the Speed Shop for an exclusive P12Q variant that delivers the particular characteristics I have been seeking. 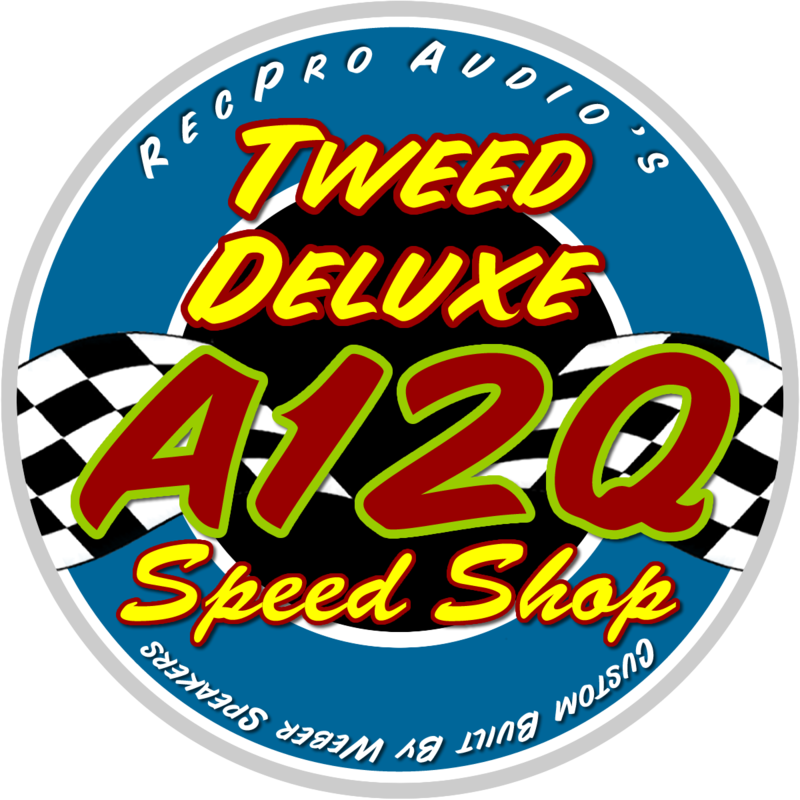 As such, the Speed Shop is very excited to announce the release of its A12Q Tweed Deluxe guitar amplifier speaker. Designed after the original P12Q speakers from 1958 to 1960, the RecPro Audio Tweed Deluxe Speed Shop A12Q captures the true vintage Jensen sound and performance from the era, but without all the hassles and risks associated with vintage speakers. Clean or overdriven, the A12Q's response is full, tight and midrange-centric with full high-frequency response but without the peaky high-edge of vintage Jensens; and excels with both single coils and humbuckers. Custom built for the Speed Shop by Weber Speakers, the A12Q delivers true vintage complexity, frequency response, compression, breakup and sensitivity. Lots of effort went into putting this guitar speaker together, and the guys @ Ted Weber: TA, Brian and CJ, did a truly wonderful job. Very special thanks to Jon Van Rhee and Dean Wiant @ Precision! Also, Steve @ MWA and Eric @ OCS. Again, many thanks to all for making this new speaker possible! STATUS 10/09/2015: The A12Q speaker sounds great! After about 50 hours of break-in, I then began to compare it against a great 1960 Jensen P12Q - just this week - and it's really, really close. So close, that I might not be able to pick it out blindfolded. I would have to say that it's got 95%+ of the "fingerprint" of the original P12Q - and that really surprised me as I wasn't sure if a new speaker could sound like a 55 year-old speaker. But, it's got all the classic hallmarks - frequency response, sensitivity, compression, break up, and most importantly, complexity. From single coils to humbuckers, the response is truly vintage. Thanks again, to everyone involved in the project! Order Information: A12Q orders will begin to be accepted via PayPal on this page, on November 1, 2015. Pricing is $130 each ($125, plus PayPal fees). Shipping is a flat $20 to the Continental US. Overseas customers, please contact me for shipping prices. 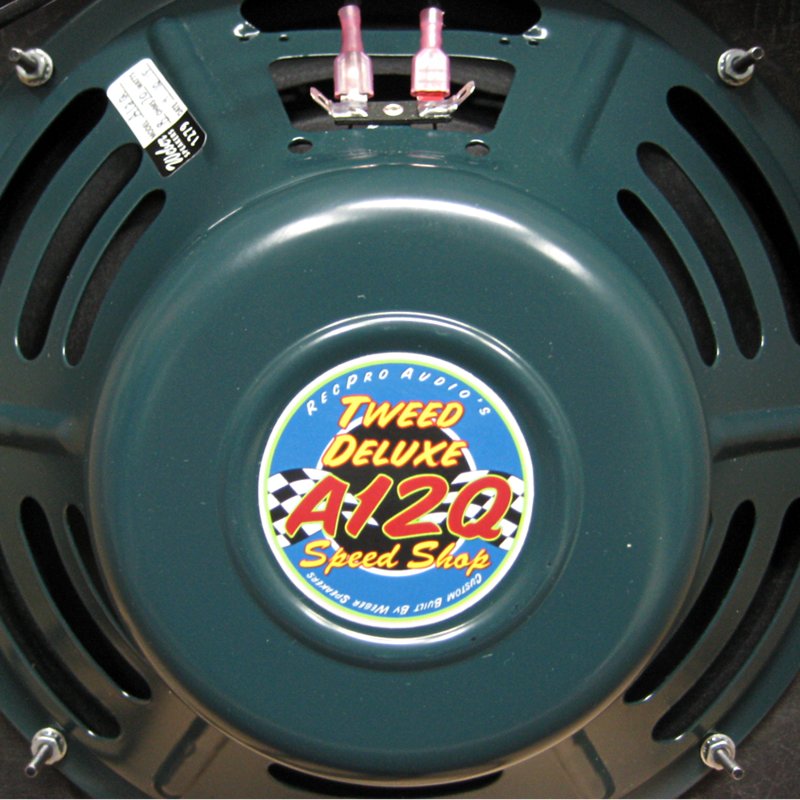 The A12Q is a 12", 20 watt, 8 ohm, Alnico speaker; custom built for the Speed Shop in the USA by Weber Speakers, and is exclusively available through the Tweed Deluxe Speed Shop. Who is the A12Q for? The A12Q is designed to perform exactly like a vintage AlNiCo Jensen P12Q (1958-1963+) and as such is ideally suited for use in low wattage amplifiers, especially Fender's 5E3 Tweed Deluxe as well as the 5D3 and 5C3 models. Any other amplifier that specifies a 12" speaker rated at 20 watts maximum output at 8 ohms can utilize the A12Q. What Does the A12Q Sound Like? The A12Q frequency response is midrange centric, providing a very round spectrum with smooth highs and tight lows. The overall response if very big and full, with plenty of authority. Some may say it sounds "American." Importantly (and particularly) the highs are not extended (like a Celestion G12M Heritage, for example) instead, they roll off nicely providing plenty of definition and bite, but without any of the edgy, high crispness that might be best described as sounding "Blackface." Put simply, the A12Q is not too bright, nor too bass heavy, and is perfect with a Tweed Deluxe - as it should be. The A12Q compresses nicely at all volume levels and provides a beautiful piano-like, glassy clean tone when paired with a single coil neck pickup; overdriven with Humbuckers, it results in classic Leslie West full-on meanness. In between, there's Larry Carlton, Don Felder, Joe Walsh, Billy Gibbons and Neil Young tones waiting to emerge. It's a great speaker for the studio as well as it's easy to get a great sound without much fuss. 57s, E906s, 421s - they all work well with the A12Q. Mic it from about a foot away off the center of the cone and it's right there, cutting though and sitting nicely in the mix. Or, put 2 mics right on the dustcap and blend. Of course, an additional room mic will fill out the picture beautifully. Frequency response is a real balancing act with a Tweed Deluxe as the amp has to accommodate single coils, humbuckers, P90s, etc., and sound great at all volume levels and pickup positions. This means the amp has to perform well and the speaker has to complement that performance; otherwise, you can end up with an amp that is a one-trick pony, or less. Amplifiers like the Tweed Deluxe are notoriously soft in low end response, depending heavily on the pickup, amp and guitar settings, as well as the guitar itself. The A12Q will sound loose and bass heavy in some situations as this is part of the Tweed Deluxe DNA. While frequency response can be tailored, you really never can dial out all the low end response, for you would cripple the amp for use with single coils and/or brighter guitars. Moreover, because the Tweed Deluxe circuit does not allow for much room to adjust frequency response, it is extremely important to install the right speaker for the widest possible performance and tonal variations. However, home-brew Tweed Deluxes - as well as some boutique 5E3s - can often be heavy in low end response and/or harsh in high-end response; and while the A12Q may help any similar amplifier perform to it's maximum, it cannot solve frequency response issues that are systemic. In other words, the A12Q will make a good amp sound good - or better, but it cannot fix a bad sounding amplifier. While there are only a few videos for the new A12Q speaker at this early date, I feel confident to also recommend any of my other videos featuring vintage Jensen P12Qs as reference to the performance of the A12Q - it is that close. Lastly, the A12Q may not be for everyone. That is why I have done my best to describe it in detail and outline its performance here; as well as provide demo videos (with many more to come) to highlight how it sounds and performs (with a Tweed Deluxe). Please spend some time watching a few of my video demos prior to placing an order for the A12Q. This will help us keep returns to a minimum. Please allow for at least 50 hours of break-in time where the A12Q will begin to loosen up a bit, exhibiting slightly more nuance and complexity, with a slight increase in high end response as well. From there it will only get better. Note: For proper break-in, please just play your guitar and avoid any schemes involving tone generators and variacs. The A12Q sounds really good right out of the box. Fair warning: If the A12Q is not working for you right away, please do not count on break-in to make enough of a difference to change your mind. The A12Q ships directly from Weber Speakers in Kokomo, Indiana, USA. 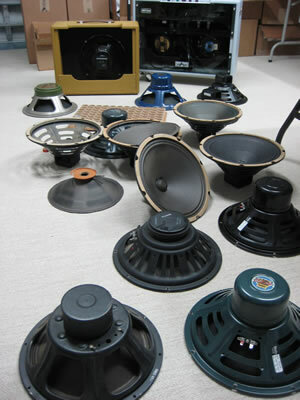 Contact Weber Speakers for an RMA# and return the speaker to them. A12Q non-warranty returns will be accepted by the Speed Shop for a period of up to 30 days from date of delivery, subject to a 25% restocking fee. Returned speakers must be in perfect working condition and show no signs of having been mounted. Contact the Speed Shop to schedule a non-warranty return. "I am hard to impress and have been around for ever, this speaker is one of the best. - Thanks again, John"
"...we recorded an album last month. I tried 5 different amps, 2 different cabs, and 4 different speakers. I could not get the recorded tone I wanted. ...I put your A12Q in and paired up with the 5E3. Ho-lee smokes... ...All I can say is wow. What an amazing speaker and what a difference it made. So much so that I went from having mixed opinions on the 5E3 to the point where now it's all i use. No exaggeration, for the record, out of 9 songs the 5E3/A12Q combination got me all the tones I needed for 8 of them, no pedals required. Clean, dirt, compressed - whatever, it did it all. It's hard for me to overstate just how much of a positive impact your speaker had. For as long as I've had my 5E3, I've never heard it sound like that. To wrap a long story up - I never thought such a simple little amp with the right speaker could sound so good and be versatile. Just wanted to say thanks for sharing your knowledge and working to make the A12Q an offering." 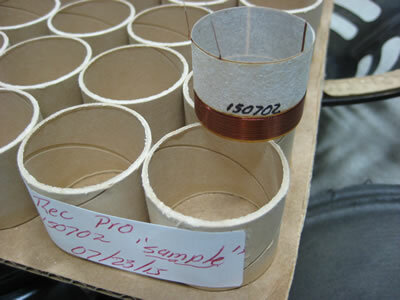 - R. M.
"Your A12Q is in my opinion probably the best speaker I have ever put in one of my 5e3's. I can now play without worry that my speakers voice coil will have some sort of meltdown. I would put it up against any of the P12Q's I have, and would choose it hands down. I can't even imagine what it will sound like once I have it fully broken in! (Only have about 20 hours in so far.) Thank you!" - A. R.
Please note: All A12Q speakers are built to order and drop-shipped directly from Weber Speakers in Kokomo, Indiana, USA. The average lead time from date of order to date of shipping is approximately 2 weeks. Tracking info will be forwarded upon shipping from Weber. Please contact Rondo with your full shipping address for an estimate. NOTE: Additional shipping charges *may* apply to destinations outside the US. Contact Rondo for a shipping estimate before ordering. Please note: All shipping costs are estimates and additional fees may apply.